After trying out almost every restaurant in Teacher’s Village and Sikatuna Village, Tim and I voted for Pino Resto Bar to be the best among the rest and a must-not-miss if you’ll go foodtrippin’ along Maginhawa. Although slightly seperated from but still very very near the famous Maginhawa street, Pino, stands tall in 39 Malingap St. Teacher’s Village, Quezon. The facade of the place looks very simple but this restaurant surely knows how to cook good food. 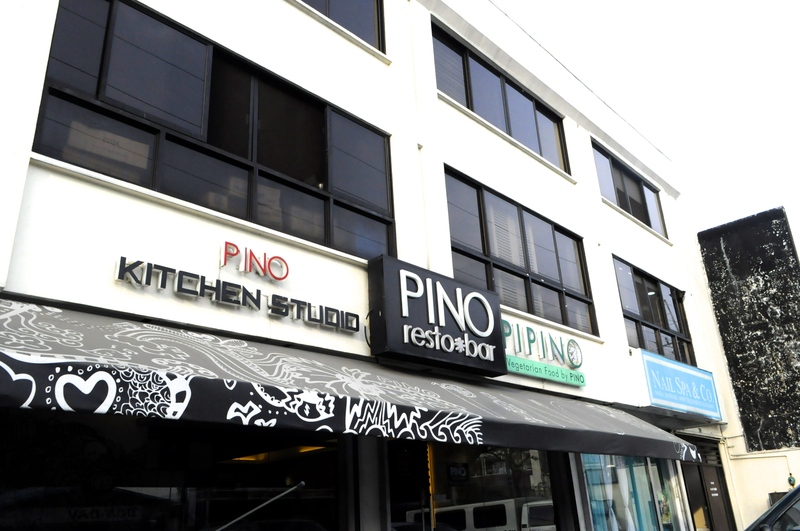 Serving delicious Asian cuisine at a very affordable price, Pino got instantly noticed by everyone in and out of Quezon City. After a quick chat with a very welcoming staff, we ordered lots of starters and a main course that looks so good in the menu. We are huge fans of appetizers, that’s why Tim ordered the Buffalo Chicken Skin. The spicy taste of the buffalo-style sauce will make you crave for it till the last bite. The bleu cheese dip complements the dish perfectly. I, on the other hand, ordered my favorite dish, the Mini Sisig Tacos. 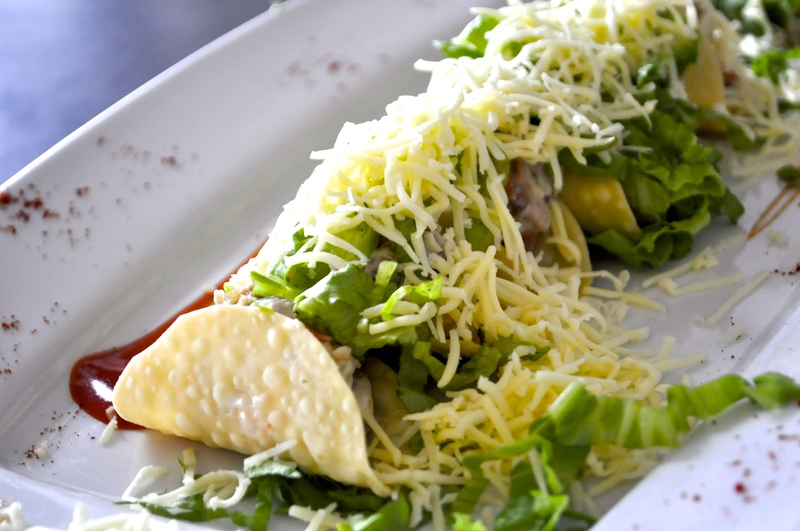 It is basically pork sisig in a cute taco shell with vegetables and cheese. Anyone who hates this dish should get their tongue checked. 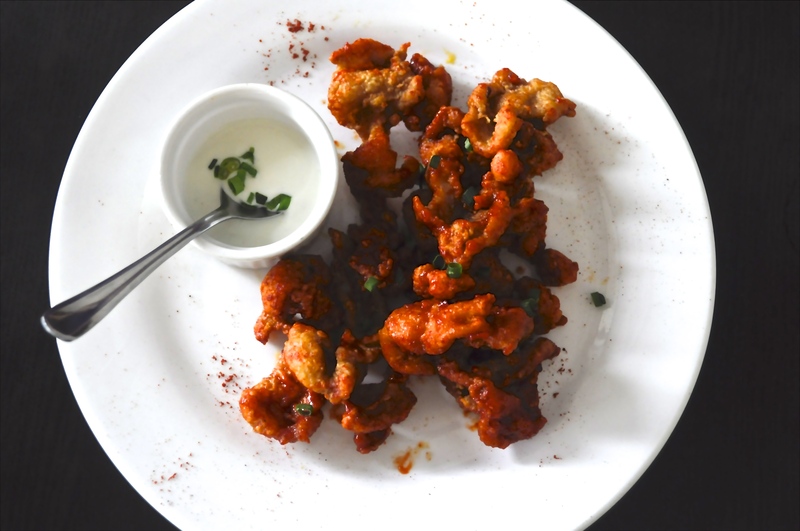 We also ordered Chicharon Bulaklak but it was so good we devoured it immediately. It was served with papaya atchara and vinegar. After our delicious and mouth-watering starters we went on with the main course. 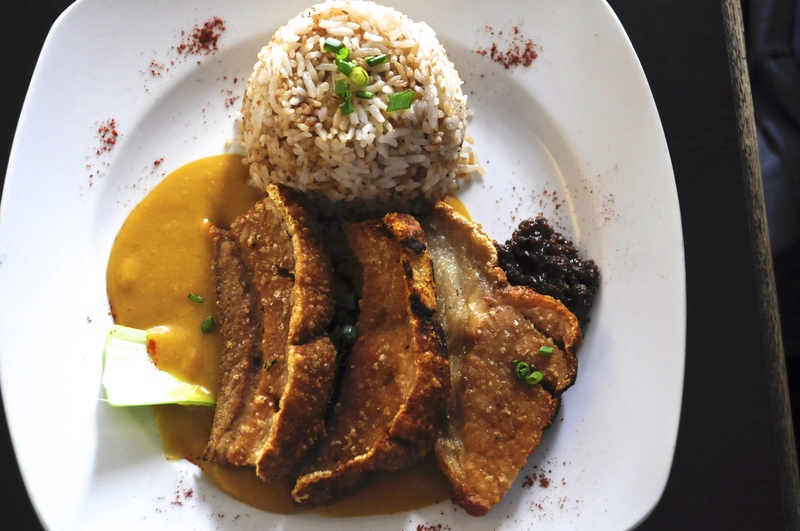 Both of us ordered the famous Kare-Kareng Bagnet because we just love our pork covered with kare-kare sauce. This dish surely did not disappoint our Kare-Kare cravings that day!! The bagnet was perfectly crispy, from the skin to the meat. The peanut buttery taste of this dish was too good and their bagoong was one of a kind. It was also served with bagoong rice which fitted the dish just fine. The photo below does not give justice to how good this course was. We highly recomment Pino to all Asian cuisine lovers especially those who loves to eat Filipino dishes with a slight twist from the traditional recipe. It’s surely a must-try restaurant when having a Maginhawa food trip! We think the owners of this place also own the Breakfast & Pies cafe/pastry shop just beside Pino. We’ll review about that restaurant soon! !